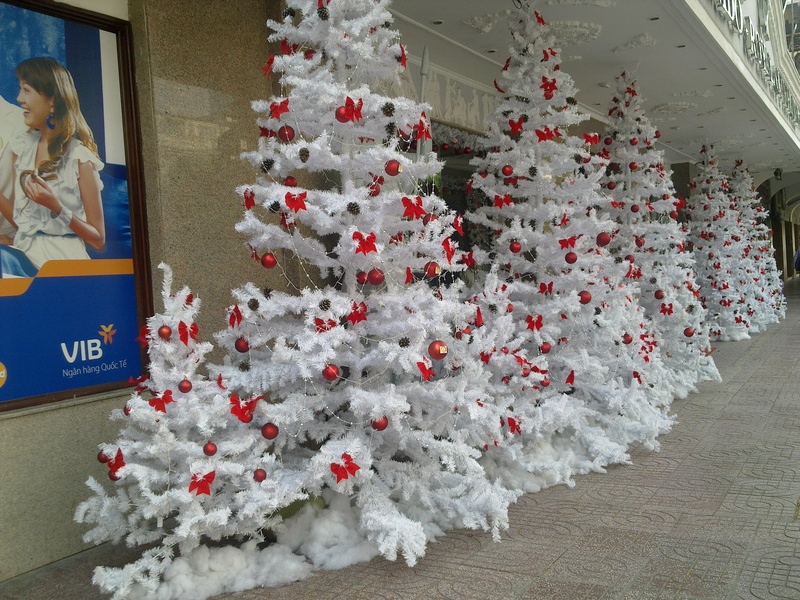 Xmas TreeS Sighting: Kimdo Hotel | Hello Saigon! I took a photo of this row of white Christmas Trees found at the entrance of Kimdo Hotel along Nguyen Hue St. a few days ago. It was actually nice to see that they decided to put 6 trees (seriously contemplating having my picture taken in front of them). Somehow, with establishments starting to put Christmas decors and all, I feel the awakening of my holiday spirit within. I still miss the holiday production back home which starts in September — I thought it was really OA starting the holidays so early in the year but having only a fraction of that holiday extravaganza in Vietnam makes me feel melancholy. I wish I were back home in the thick of frenzy that is Christmas shopping, Christmas parties, wrapping of presents! But for now, any reminder that it’s Christmas will do for me! Finally, it’s December! This entry was posted in Seen in Saigon and tagged Christmas. Bookmark the permalink.